A bridge replaces missing teeth with artificial teeth. It looks great, and literally bridges the gap where one or more teeth may have been. A bridge can be made from gold, porcelain, or a combination of these materials and is cemented or bonded onto surrounding teeth for support. A "fixed" bridge is not removable. 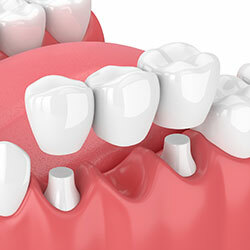 Besides replacing missing teeth, a bridge can help maintain the shape of your face and alleviate stress in your bite. The success of any bridge depends on its foundation — the supporting teeth, gums, and bone to which it is attached. Therefore, it's very important to keep your existing teeth, gums, and jaw healthy and strong.